A unique comprehensive health supplement ideal for over 50s, combining the most protective nutrients from the world’s healthiest diets. How can you stay healthy into old age? Genes and lifestyle play a part, but nutrition is a major factor. Especially as certain nutrients can switch good genes on and bad genes off, and others protect DNA from damage. You’ll want to ensure you include them all in your diet, particularly if you are over 50. You can with NutriShield Premium, the UK’s most comprehensive health supplement. In a convenient daily sachet, six different caplets contain 43 separate protective nutrients. 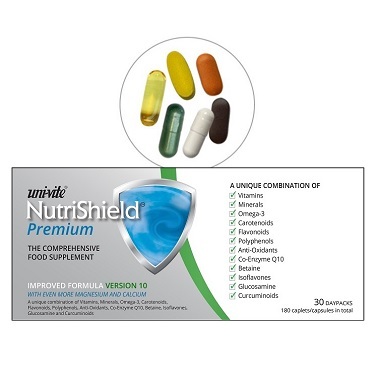 NutriShield Premium is a heart, brain, skin, joint and eye supplement ALL IN ONE. The full range of essential vitamins and minerals at optimum levels, including 800IU Vitamin D3 (the sunshine vitamin) and Vitamin K2. One-a-day supplements usually contain just the minimum recommended daily amounts (RDAs) of vitamins and minerals. But RDAs only prevent outright deficiency, while OPTIMUM levels can make a noticeable difference to health and energy. High-strength purified Omega 3 Fish Oil (high EPA/DHA in premium triglyceride form). Omega 3 fish oil is important not just for heart health, but for joints and brain function. Most of us find it hard to meet even the 5-a-day target for fruit and vegetables EVERY DAY, let alone more! Co-Enzyme Q10 or CoQ10 is known to assist in the production of energy from mitochondrial cells and many studies have been conducted on its role in protecting the heart and cardio-vascular system. Betaine can help to lower homocysteine, high levels of which are linked to heart disease. Betaine also supports the nervous system. Cell-protective Soy isoflavones genistein and daidzein (derived from GM-free soy) are linked to exceptional Japanese longevity.